“Many of the empty Spanish properties were repossessed by banks after owners defaulted on mortgages…. My Comment: There is a similar condition in the United States. All this leads to a revolutionary explosion; people will demand the essential conditions for existence. The method of integral education calls to satisfy the requirements necessary for existence—in exchange for including everyone in the mandatory system of integral education. Question: How do you justify the Creator? What is included in this process? Answer: Justifying the Creator means calibrating yourself correctly in the direction of the real perception of reality. Although we don’t see or feel that way, we do want to feel it. Let’s suppose that I have a crooked ruler and I constantly measure everything in this crooked manner. Now I want to straighten this ruler by force so that all my measurements and my calculations would be according to a straight ruler. The straight ruler is the condition that the Creator is good and benevolent and that everything that I see is the world of Ein Sof (Infinity), a wonderful ideal world that is the best world there can be. Whatever I see differently is an indication of the difference between my corrupt and fictitious perception and the right perception, which I still lack. But if I make an effort to attain the right picture, the revelation of the infinite force of the good and the benevolent, that there is none else besides Him, I perform a correction in my senses; I calibrate them so that I can perceive reality correctly. Then I suddenly see a totally different picture! I was simply cross-eyed and so the world seemed distorted, and now I see its real form. I calibrate my tool that is not calibrated in order to see that the Creator is good and benevolent. The whole distortion was only in my senses and not in the Creator whom I thought had created a bad world. It is because of my corruptions that I saw that the perfect world of Ein Sof is so corrupted. But thanks to the correction, I come closer to the truth and reach adhesion with the Creator, in agreement with Him. This is the only thing we should do: correct our perception. The wisdom of Kabbalah is the revelation of the Creator to the created beings in this world, but how can you reveal Him in this world? We think that this world is where we are until we die. This isn’t exactly so, but actually a much deeper concept. The revelation of the Creator in this world means that we should discover and see the world of Ein Sof above the picture of this world. This revelation is a result of our efforts: the moment we really want to see the Creator as the absolute good and benevolent, He will be revealed, since then we will be asking for our correction and so the Light will come and fix everything. Question: A person usually understands that everything comes from the Creator, but thinks that it is impossible to understand and to justify Him. Answer: No, we actually come to understand the Creator, to justify, reveal, measure, and attain the whole perception and wisdom. This is actually what we call the revelation of the Creator to the created beings which should fill all of a person’s cells, both the emotional and the mental ones. Question: How do we advance to a state of Hafetz Hesed? Answer: Advancing is only possible through the Light that Reforms, in that we strictly carry out those deeds that the Kabbalists advise us to do. Here very strict, relatively simple, consistent work is required, that we must carry out time after time, while the Light influences us and brings us to the result. Question: Must I invest some kind of demand, a special prayer on my activities? Answer: Your demand must be not to demand anything other than bestowal. And this prayer is also the result of the influence of the Ohr Makif (Surrounding Light). We must pass through a process of detachment from our ego, and this is very painful. And in order to make this pain not too unbearable, it’s divided into very small steps according to a person’s ability to tolerate it. If you want to hasten this process, the group is given to you. Try to share this process of detachment with it. There exists a unique patent, a wonderful opportunity here that makes it possible for us to do this, the helping Klipa (the egoistic forces). We constitute one body, a collective flesh, only it is cut into many small pieces. If you were to now feel how they cut your living flesh into many pieces, you would not succeed in holding onto such a feeling. Just imagine that they are beginning to gradually cut piece after piece away from you. It’s impossible to endure this at all. In order for you to not feel this pain, they gave you a feeling of a lack of contact with everyone. And in such a circumstance you can go through all of these actions. This egoistic Klipa that separates us from one another helps us to pass through these states more easily. This is to say, these two parts, both the Klipa and the Kedusha, are working towards the same goal. The Torah, “Exodus” (Ki-Tissa), 33:9-33:10: And it would be that when Moses entered the tent, the pillar of cloud would descend and stand at the entrance of the tent, and He would speak with Moses. When all the people would see the pillar of cloud standing at the entrance of the tent, all the people would rise and prostrate themselves, each one at the entrance of his tent. As soon as the Creator approaches a person, one’s egoistic desire falls, meaning it bows before the property of bestowal. To have the Creator descend to us, we need a correct preparation. All depends on our incentives and actions that trigger the Creator to gradually descend to us. Then, our desires change. Question: Do worries and anxieties that we go through in our work mean that we approach spiritual properties? Answer: In general, those are bad qualities since in reality a correct state is a state of joy. Joy has to be present at the time of our descents. This is exactly how we can check ourselves: Whether you meet “nights” (darkness that gives you a chance to rise) with joyfulness. Can we appeal to the Light from the darkness? We have to convert all our troubles into enjoyment. There is no alternative, since everything comes from the Creator with one purpose: to promote our advancement. In order to succeed, we need support from our surroundings, a group. If you have a group, there won’t be any problem. The main thing is not to dwell on these periods in life. The Torah, “Exodus” (Ki Tissa),” 33: 11: Then the Lord would speak to Moses face to face, as a man would speak to his companion, and he would return to the camp, but his attendant, Joshua, the son of Nun, a lad, would not depart from the tent. Those who have already obtained the property of bestowal speak with the Creator as equals because the quality of Bina in its highest point is similar to the Creator (the property of Keter). At that level, they merge with each other. Later, Joshua ben Nun enters the land of Israel (“land” derives from the word “Eretz” meaning a “desire,” Malchut) since Malchut is ready to accept the quality of bestowal, whereas Moses is unable to enter the land of Israel because he remains in the pure property of Bina, thus being detached from Malchut. He can correct it, but he is unable to enter it. It will become possible only when the entire land of Israel will be conquered, meaning when Malchut will accept all properties of bestowal and love. Then, the property of Moses will reveal itself. How does the whole and an individual part relate to one another? How could a small group gathered by Abraham in ancient Babylon influence the development of all of humanity? Why does everything revolve around this group? Why does this group continue its “rotation”? The problem of this world is that we “count” humanity as if it’s livestock. We evaluate humans by millions and billions; this kind of calculation seems sufficient to us. We just are unable to make qualitative calculations. It results in a constant conflict between quality and quantity in this world. We proclaim that we are equal. However, how can it be true if one’s possessions are comparable with the assets of a billion others or if one’s health is worth the wellbeing of thousands of others? Are we really equal just because each of us has a body? Is it a criterion that should be used when evaluating human beings? We are unable to “appraise” others because we lack true measurement tools. What are we comparing: feelings, intellect? How can we equate one person to another? It also is applicable on the spiritual path. Our spiritual goals are also quite different. Each of us has personal qualities, individual “destiny,” way of advancement, and a unique purpose in the whole system that serves as a common body where each cell is important but all cells and organs are still extremely different. This explains why the role of Abraham’s group is so important: This entity of people attained a new purpose that was totally opposite to other nations’. Babylon was driven by an egoistic desire that increasingly expanded and enhanced, whereas Abraham’s group, on the contrary, focused on the will to bestow. Egoism can continue growing under the condition and to the extent of advancement of the altruistic desire, by faith above reason. Abraham students’ advancement dramatically differs from the progression of other nations: The latter have developed intelligence, whereas the first group concentrated on faith. This explains why at the time when Abraham’s group faithfully followed its predestination, they were not developing sciences or culture such as music or dancing. They paid almost no attention to these things; rather, their major exertions were made towards spirituality. It was their only focus. Later, other nations took advantage of the “fruits” of their work and on this basis they developed sciences, culture, and arts. For example, ancient Greeks borrowed the first “sprouts” of their philosophy from the wisdom of Kabbalah. Later, they admitted this fact. As we see, the specifics of the relationships between the whole and a part, between small nations and the entire humanity, stayed intact throughout all of history and will be preserved in the future. As Abraham did, we collect friends from all over the world and entreat them to choose a common path to the Creator. Still, we remain a tiny minority. It’s supposed to be like that because there has to be a balance between the quantitative powers of all of humanity and our qualitative energy. Both parts have to be harmonized. For example, if a small child receives a huge power, he might gravely hurt others, but if he acquires deep understanding of what he is doing without being given extra powers, then he won’t be able to implement his understanding in life. That’s why everything has to be balanced so that our body, intellect, and feelings are correctly proportioned while they grow. It means that we can even become smaller to the extent of the development of the rest of the world. It is said: “They shall all know Me, from the least of them unto the greatest of them.” They will know Him through us, but they won’t join us by the millions. It will happen only at the very last stage of correction. Baal HaSulam, Shamati #53, “The Matter of Limitation”: …This is the meaning of, “Serve the Lord with gladness.” This is so because during the Gadlut it is irrelevant to say that He gives them work to be in gladness, since during the Gadlut gladness comes by itself. Instead, the work of gladness is given to them for the time of Katnut, so that they will have joy although they feel Katnut. And this is a great work. This is called the main part of the degree, which is a discernment of Katnut. This discernment must be permanent, and the Gadlut is only an addition. Also, one should yearn for the main part, not for the additions. In our work, we reach an intersection a crossroads, a fork in the road, after which we already have to measure our states along the spiritual road, either inside our desire to receive pleasure or outside it. Everything depends on where we measure our state, our success, our continuous progress. If we measure it inside the desire, we are happy about the greatness: the height and the filling. It is the left line that pulls us to the side of the ego, according to which we aspire to see and to measure everything. On the right line we measure everything in relation to the group and to the Creator. On the right line, we don’t notice the state we are in and accept every state as the perfect state. This means that we don’t take our feelings into account, no matter what the Creator sends us. We always measure everything according to bestowal, which means outside ourselves. On the left line it’s the opposite: I have no other thoughts but thoughts about myself and about what happens to me, and this is the only thing I worry about all day long. Accordingly, the work along the two lines is different and it depends on what I demand in each state. If it is the right line, I demand to remain the way I am or worry only about how not to lose the direction to bestowal upon the Creator through the environment and through all of creation. Here I work on my smallness in order to make myself as small as possible. I only want to bestow upon the Creator as much as possible and not to feel that I bestow or that He enjoys my bestowal. This means that I diminish the response in every possible way, cut off all the wires and all the ways by which I can get a response for my action of bestowal, which I try to increase as much as I can. This kind of work is in maximum bestowal and zero reward. To the extent that I can perform clean calculations with regard to absolute bestowal without a reward, my spiritual level is measured accordingly (like Rosh-Toh-Sof). Thus I already stabilize myself and begin to mutually work with the Creator, as the Creator opens up more and more opportunities for me. When I am stabilized on the previous level, I ask for more and more powers in order to increase my bestowal. Of course, I have to overcome my ego more and more in order to attain this and in order not to receive any reward in return. And what I do receive from the Creator I have the opportunity to turn into bestowal, and this is extra work in addition to this work. This is how we advance. The problem is at the actual crossroads, the split that is created. This work is repeated on every level. As we ascend to the next spiritual degree, the shattered Reshimot (reminiscences) are revealed and I have to stand at this crossroads in order to be sure where the left line is and where the right line is. I cannot simply turn to the right and not look to the left at all. This is impossible because one line is based on the other line. 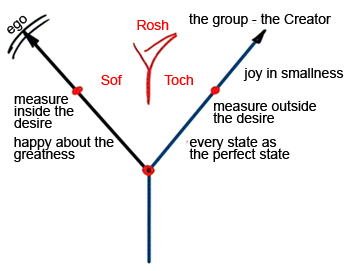 If I follow the right line correctly and reach a certain point, the left line also grows to the same extent, but I cut one line from the other, and so the “trunk” (Toch) and “end” (Sof) of my spiritual Partzuf are created. The place in which I calculate things is called “head” (Rosh). Thus I begin to build my spiritual Partzuf. This is practical spiritual work. This is all based on the picture of the world that the Creator depicts for me as a result of my attitude to reality. Question: Where is the point of our independence in the drawing? Answer: We are independent only at the crossroads, but it always exists. We have to constantly feel that we are at a crossroads, as it says: “They should seem new to you every day.” All the time we have to decide and always choose the right line, and instead of erasing the left line, we should advance me on top of it. We need to feel that we are totally within the Light, like a body that is immersed in water. From all sides, my body is surrounded by water that is closely connected with all of my movements. In this state, I need to feel that I am within the Upper Light so that through each of my tiny movements, in thought or in desire, in each tendency of my heart and brain, I immediately invite the Light to come to me. This happens immediately without any transition. I need to reach this sensation in my life. All of us are drowning in these waters and receive oxygen only at the instant when we move towards each other. If our hearts are drawn to unite between each other, then we have something from which to breathe. If the heart does not want to unite, then we cannot breathe without air. We need to feel this state in our spiritual work: We are submerged within a sea of Light, like water, and the oxygen only depends on the connection between us. Thus we need to somehow force our hearts to strive towards unity. The presence of oxygen depends on our closeness to each other. And then we begin to connect, not in order to receive oxygen, but in order to give joy to the Creator! How can we raise the longing to receive oxygen to longing to give joy to the Creator, even though I am suffocating without air? In the end, we reach the state where we suddenly cease to need oxygen and feel like fish in water! We don’t even think about it, but only on how we can bring Him joy.